Welcome to the GNOM WORLD — an unusual underwater robot for professional and amateur use! 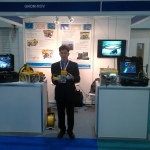 GNOM is a revolutionary remotely operated underwater vehicle (ROV). Advanced technologies solutions were used by creation of GNOM and it make our product incomparable to the other ROVs in the world — it is portable, lightweight, easy controllable and affordable! 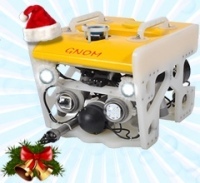 GNOM — is the first personal underwater robot (ROV) in the world. It has 3—5 times less power consumption than other small size ROVs, built-in battery and video monitor/recorder. Everything is packed in two cases, the weight of complete system is only 15—25 kg. Very thin cable (2—3 mm diam) allows real work at the depth of 100-150m. You can take it with you as a hand luggage, and you need nothing more to start your work — everything is ready to be used! We have been in the market since 8 years and we are using our impressive experience in underwater technologies to make continual improvements in GNOM. More than 500 units have been already sold to many customers in Russia, Ukraine, Poland, France, Italy, Germany, Spain, USA, India and other countries. The GNOM User's Manual contains many technical details and recommendations for users. We support our users with full information and service. For further information, please, contact us. If you want to become a dealer — you're welcome and we are happy to work with you! Let this Christmas be bright and cheerful and may the New Year bring new happiness, new goals, new achievements and a lot of new inspirations on your life! Underwater vehicle GNOM submersible is used to control and clean fishponds in Chile. 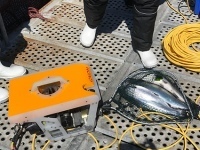 GNOM underwater robots are used to monitor the condition of fishponds in Chile. Underwater vehicle equipped with a net, removes dead fish. Congratulations to the team of the Ministry of Defense - the winners in the ROV competition! The team of the Ministry of Defense took the first place in the competition of small class ROV.